At the age of 6 or 7 all boys and girls go to school. I am 15 years old and I am the 9th grader. I study at Talovaya secondary comprehensive school. It is a school with its history and traditions. Next year we are celebrating the 100th anniversary of it. My school is large. There are 1281 students in it. Talovaya school is situated in the ceter of the town. There is a schoolyard around it. You can see a lot of flowers here in spring and summer. To the left of the building there is a sportsground. Our school has got three floors. There are primary classes, workshops for boys, a cloakroom, and a gymnasium on the ground floor. If you enter the building and go to the left you see a school canteen. We have breakfast and lunch here. Our school has got a library. It is on the ground floor too. There are a lot of interesting new and old books in it. On the first floor you can find computer classes, English, History, Maths classrooms, workshops for girls, medical and headmaster offices. Two teachers' rooms are on the first floor too. 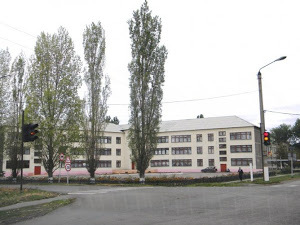 Classrooms for Physics, Сhemistry, Biology, Computer science, English, Russian and media center are on the second floor. The school year begins in September and ends in May. It is divided into 3 terms with holidays. Our classes last 45 minutes. We have breaks from 10 to 20 minutes. We study various subjects at school. Our lessons are interesting and exciting. School is not only a place of education. It is a place where we develop our communicative and social skills. Everyone has an opportunity to join a school club, to take part in sport contest and to be successful. I like my school.